As campaigning for Nigeria's elections wraps up, two days before the vote, young people are calling for the government of the future not to forget them. RFI-s Anne-Marie Bissada is in Abuja, where she met some of the youth. As we cruise through the increasingly busy streets of Abuja, American rap blasts in the background and my driver, John, easily weaves in and out of traffic as if he has been doing this his whole life. "I'm an attacker!" he exclaims proudly when we talk about football and what position he plays. You're a hustler, I ask. Which is why my 18-year-old chauffeur for the day is wearing a plaid shirt, jeans ripped at the knee and trainers to his day in the office: his car. He finished a degree in business management, but having found no work, was forced to think fast and decided driving would work. "I can't imagine myself at my age driving a car up and down just to make something for myself. Had the economy [been] ok, I would have been in the office or been somewhere earning big money." According to the latest report on Nigeria by the United Nations Sustainable Development Partnership, the country has an estimated population of over 180 million, making it the most populated country in Africa and seventh in the world, and annual growth rate of 3.2 percent. But the real numbers come from the youth. The report notes that the "majority of the population is young with 45.7 percent under 15, and 31.7 percent between the ages of 10 and 24". Meaning the youth nearly make up half of the country's population. And yet presidential campaigns seem to cast aside this crucial segment of society, instead focusing on the tried and true platforms of security, corruption and the economy. That last point is a key factor for John. "The real main issue is our economy. Our economy is so bad that plenty of youth [are] on the street. They are doing nothing." Although there was a real drive to encourage more youth to participate in these elections, much have it has fallen to the side as the two main presidential candidates, both in their 70s, remain the heads of the major parties: the All Progessives Congress, the APC, and the Peoples Democratic Party, the PDP. Incumbent Muhammadu Buhari heads the APC while the former vice-president, Atiku Abubakar head the PDP. "The APC and the PDP are the two major parties for now that are heading for presidential election. It seems people like the PDP but most are going to vote APC because of what the president is doing. Although he wasn't doing well." He explains that most people seem to like Buhari despite the feeling that he hasn't done much. But "the devil we know is better than the angel we don't know!" chuckles John. 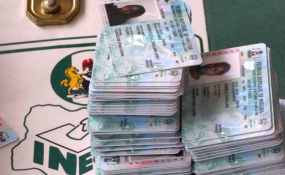 John himself won't be voting on 16 February as he couldn't get his PVC, his permanent voters' card issued by the Independent National Electoral Commission. He tried to get his card on a few occasions but each time, the national electoral commission didn't have it for him and the collection date has passed. But had he received it, "Of course I would have voted, because a vote counts." A vote not cast can not make a difference. Instead, he asks the government of the future, regardless who wins, to cast its net wider and remember the youth. "I'm just pleading for the next government try to make our economy [better]. Also, you have to encourage the youth because they are ... the future of tomorrow." He adds that if the new government would focus on the youth, it would provide them with a chance to find work that best suits their skill set. "If we go somewhere else now you see youths are wandering up and down. You walk the street and they are selling tea or water, selling all kinds of things because they don't have work. And the economy is no good. "So to the next government: please try to do something for us! We are youth. We are very strong." And as John finishes up his interview, he adds: short of any changes brought on by the new government, he may just try harder to be a professional football player. A surer way to get out of doing work he hustled to get to avoid doing absolutely nothing.